The peepers also go by the name of Northern Spring Peeper (Pseudacris crucifer crucifer Wied). Here on the land the roar of the peepers is hidden behind the main office building (now called the Great Eastern Sun building). It can be a shock if you walk around the corner of the GES toward the ponds and get a sudden exposure to 5,000 peeps. Here, you can listen to their “concerto”. There are a few turkey gobblers left croaking in the night also. Turkey gobblers don’t seem as loud as the peepers. They may be fewer although they are much larger. There were 54 turkey gobblers in the first pond one morning that I counted. Many more were hiding in the woods and shrubs around the ponds. Their earlier chorus is to me like the sound of turkeys gobbling, hence, my name turkey gobblers. 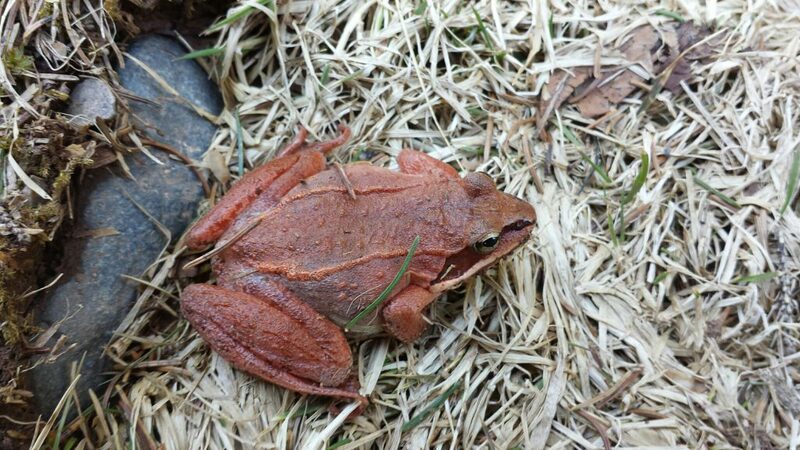 Technically they are called: Wood Frog (Rana sylvatica LeConte). The turkey Gobblers started about three weeks ago. Sparsely at first then building to a real racket, even when the nights were still cold. They lured in a pair of ducks. There was not much food for ducks in the first pond so I checked to see if they ate frogs. No official source seemed clear. There were some sites that said ducks ate spawn and eggs. One site said spawn doesn’t taste very good. In any case now there are two sets of frogs spread in places throughout the pond. There will likely be thousands of tadpoles in the next few weeks and wave’s of frogs moving into the forest after that. The bullfrogs are very few right now. I haven’t had a fresh look to see just which type of frog they are. It seems a bit early for them to be: Rana catesbeiana Shaw. I will know soon.